The red oak and black walnut bell stand, now a permanent part of the West Chicago City Museum’s collection, is surrounded from left to right by Tom Tawney, Lorenzo Covarrubias, Fernando Ramirez, Jeff Perkis, Mayor Ruben Pineda and Sara Phalen. West Chicago, Illinois: August 28, 2015 – Downed trees from the storm that hit Reed-Keppler Park in West Chicago on July 1, 2012 continue to give back to the community more than three years later through the talents of architect, woodworker and former resident Jeff Perkis. The City of West Chicago commissioned Perkis to create a lasting legacy that celebrates the heritage and culture of many of its residents It will play a major role in the upcoming Mexican Independence Day Parade and Celebration, to be held downtown on Sunday, September 13, 2015. A four-foot tall, solid red oak bell stand with walnut accents, sturdy enough to hold the approximately 80-pound train bell, which has been at the center of the spirited historical re-enactment of El Grito de la Independencia or the Cry of Independence, was built with the repurposed wood that Perkis and his uncle, Ron Myers, milled a couple of months after the storm. As a member of the Illinois Wood Utilization Team (WUT), as well as a member of the Chicago Furniture Design Association (CFDA), Perkis is a specialist in sustainable design utilizing urban wood. He created Out of the Woods after the storm hit and worked with architecture students and Associate Professor Paul Pettigrew at the Illinois Institute of Technology to design and fabricate various pieces of extraordinary works of art. Perkis became aware of the need for the bell stand following an introduction to West Chicago resident, Tom Tawney, who also has strong ties to the community. Tawney’s father-in-law, Lorenzo Covarrubias, emigrated from Mexico in 1957 as one of the first Mexican families to settle in West Chicago. He holds the distinction of being West Chicago’s Patron de la Campana, or Patron of the Bell, and has offered the use of his bell for West Chicago’s El Grito for the past 23-years. However, over the years, its makeshift stand was worn and in need of replacement. The two men agreed to work together on a design, and the City agreed to underwrite the cost of the labor and materials to build a new stand. From a design standpoint, the decision was made to replicate some of the styles already existing within the community, particularly the Arts and Crafts style of many of the homes in the area. Perkis also referenced work done by architect brothers Greene and Greene, and ended up translating elements of these designs into his own. His fine craftsmanship and woodworking skills produced a stand that is strikingly beautiful and worthy of the momentous historic event that it celebrates. The project has come to have great significance for Perkis, and he became introspective recently about its meaning for him. “I grew up playing baseball, football and soccer at Reed-Keppler Park. I spent a large part of my childhood in that Park”. 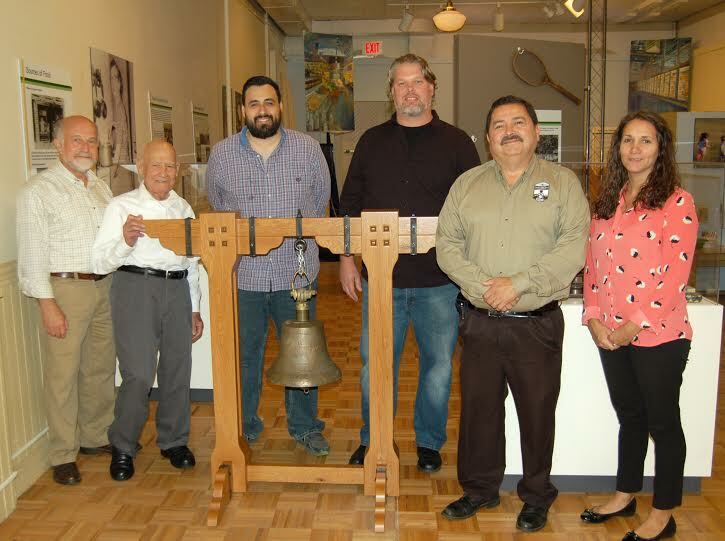 Perkis presented the new bell stand to the West Chicago City Museum on Wednesday, August 26, 2015, surrounded by fellow residents Tom Tawney and Lorenzo Covarrubias, Mayor Ruben Pineda, Museum Director Sara Phalen and Mexican Cultural Center DuPage’s President and event organizer, Fernando Ramirez. Perkis plans on using some of the saw dust and wood chips he collected from the project to make paper on which he will print the details of the stand’s creation so that it will “tell its story” for future generations. The stand will become part of the City’s permanent collection and remain at the Museum when it is not being used at the City event.